You can't beat the Original. 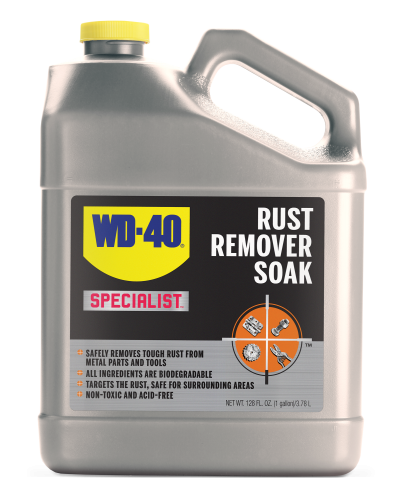 Known as The Can with Thousands of Uses, WD-40® Multi-Use Product is the versatile penetrating oil and favorite that gets the job done right. Our multi-purpose formula helps free sticky mechanisms, loosens up rusted bolts, displaces water and moisture, lubricates hinges, and protects tools and metal parts from rust and corrosion. Count on WD-40® Multi-Use Product to help you live life hands on. The WD-40® Specialist® product line focuses our versatile formula into the perfect maintenance solution for your specific job. Whether you need a penetrating oil, a lubricant, a cleaning solution, or rust removal and protection, there is a solution here for you. Keep your bike in peak performance to match your own with WD-40® BIKE® products. Specially designed to provide your cycle with superior cleaning, lubrication and protection, and tested by bike retailers and mechanics, WD-40® BIKE® is made for casual cyclists, bikers and athletes alike. Put the petal to the metal with WD-40® Specialist® Motorcycle. This line of products is designed specifically for motorcycles with speed and safety in mind, taking your performance to the next level with cleaning, lubrication, and protection solutions.